Nearly every home depends on wood for its primary architectural features and for numerous interior and exterior additions. For this reason, carpentry is an important part of home maintenance and home improvement. Sometimes homeowners need assistance with carpentry repairs and home improvement projects. When you have home carpentry needs, you can rely on an experienced Sears Handyman to get the job done. Our handyman technicians have experience with numerous home improvement projects and can perform both repairs and additions at an affordable price. For these and other home carpentry needs, you can contact a Sears Handyman. 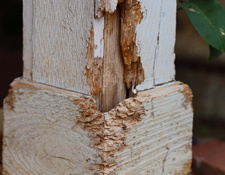 Wood rot occurs when untreated wood is exposed to water for an extended period of time. Most of the time, water simply causes fungi that stains wood and discolors it, mostly creating cosmetic damage that could lead to structural problems over time. At other times, different kinds of fungi grow that decompose the wood’s structure, causing certain areas of the wood to not only change color but lose their structural integrity by becoming softer and more brittle. If allowed to proliferate, this fungus can cause serious damage to exposed wood. For minor wood rot repair needs, repairs are usually relatively simple for an experienced handyman. Minor repairs require that the rotted wood be stripped from its source and that the source wood be treated with special chemicals to restore its integrity. For more major wood rot repair, like to large areas of a wood patio or deck, entire panels or boards may need to be replaced. These jobs are more laborious, requiring more time and labor to complete, not to mention carpentry expertise. If you have wood damage as the result of wood rot due to water damage, you can call on a Sears Handyman for assistance. Termites have become a particular nuisance in recent years, especially to homeowners in certain areas of the country where termites are prevalent. Termites can cause extreme financial difficulty for homeowners—not only to remove a termite infestation, but to repair any damage termites have caused to barns, homes, sheds, or other wood structures. Termites damage around 600,000 homes and cause about $5 billion of damage annually. 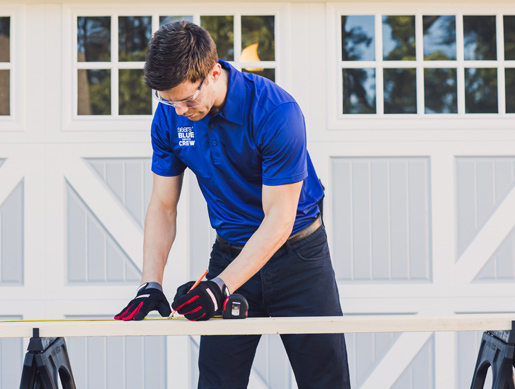 When you have minor to intermediate damage to wood structures, a Sears Handyman can usually help. Our carpentry experts can solve problems that have occurred as a result of termite damage to decks, patios, sheds, and some home fixtures. 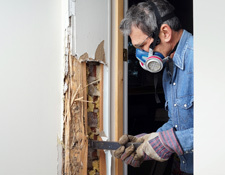 For more major termite damage, a contractor may be needed, but for termite damage that has not threatened the structural integrity of a home or large structure, our handyman technicians can help.